Editor’s note: This is a guest post by Emily P. Freeman, a writer who creates space for souls to breathe. Her newest book, A Million Little Ways, is an invitation to uncover the art you were made to live. Connect with her at her blog or on Twitter @EmilyPFreeman. You already have what you need to move into your world — so move. Contribute. Make art. Stop waiting to be picked. It sounds right and maybe even easy. But why, then, are so many of us still waiting to be picked? There are as many obstacles to showing up in the world as there are people. Here are three paralyzing statements that keep me from my best work — and maybe they do the same to you. Someone else can write better, love better, lead better, speak better, teach better, design better, parent better, or pray better. It doesn’t matter what your art is. It might seem counter-intuitive at first, but consider the freedom — Yes, someone else can do it better and they probably already have. There is nothing to win, so you are free to stop competing with the world. You don’t have to be the best one saying or living something true. You just have to be yourself. Consider the impact this constant measuring and weighing is having on your soul. Agree that someone else can do it better. But also agree that doesn’t mean you can’t do it, too. You may not be the first or the best to say it or live it, but your saying or living it may be the first time someone finally hears. Maybe you think it isn’t the right time to show up. Maybe you don’t feel ready to write that book, try for a baby, take that job, quit the one you’ve got. But showing up where you are with what you have is all you can do. You have your two hands, your sick parents, the items on your to-do list. You have your extra deadlines, your diagnosis, the children at your table. You have been given your life, what you hold in your hands, the ground beneath your feet. You have been asked to show up. It’s true, it might not be the right time to do a certain thing, pursue a particular endeavor, or make a final decision. But a lot of times we confuse readiness with courage. 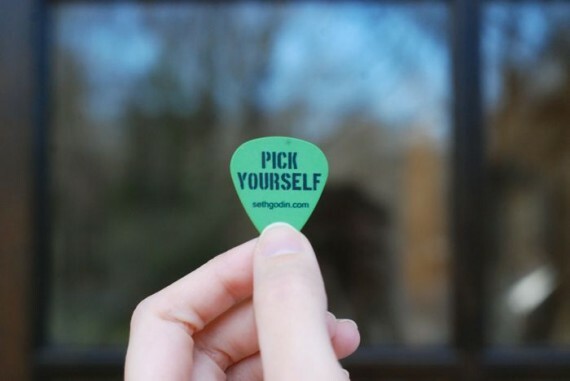 It’s hard to pick yourself when you don’t think it’s going to make any difference. The only reason we would ever call something a waste of time is because we have a certain idea of success and anything short of that idea we label “waste.” Or maybe we are adhering to someone else’s idea of success and we adopt it as our own. For writers, this might be something like this: My writing is only worth it if I get a book published. Are you becoming more fully yourself? There is courage in connection — with your truest self, with the truest self of others, and with God. If practicing your art brings you closer to this kind of connection, if it allows you to be vulnerable in ways you weren’t able to be before, then your art has not been wasted. Did this post resonate with you? Check out Emily’s new book, A Million Little Ways on Amazon. What are the statements keeping you from your best work? What obstacles hold you back from picking yourself? Share in the comments. Emily P. Freeman is a writer who creates space for souls to breathe. Her newest book, A Million Little Ways, is an invitation to uncover the art you were made to live. Connect with her at her blog or on Twitter @EmilyPFreeman. Boom. “redefine success in your art”… Thanks Emily! Amen. I loved this, too! Emily, it’s clear that we’re currently going down a similar path with our creative endeavors as indicated by our exchange on Twitter yesterday. (which, by the way prompted this post that I published this morning. Going along with the idea of creative dissatisfaction, this is definitely something I need to think about. With my design and with my writing, I have a tendency to focus on how I feel about — rather than what my readers and site visitors think. Great stuff today, definitely some encouragement that I needed. Thanks for writing it! “are you becoming more fully yourself?” gracious these words struck something deep inside my soul. i love this post. I think that the fear of becoming my best self – sometimes paralyzes me. Why is that? Why are we afraid of being successful? Thanks so much for this. I am often gripped with ‘they can do this better than me’ when this can be reframed to say ‘they are doing this differently to me’. When I feel this, I take a step to connect with the person – learning from their talent and connect with them through the art of writing. it’s a work in progress ! Great post. We artistic types are very good at holding ourselves back in this way and then wondering why we are not achieving. I trawl writers’ blogs for writing advice and some of the best I have found is to let go of the ‘dream’ of being a writer and head instead for realistic goals. This also means seeing yourself as a success when you achieve little steps along the way to your goal. For me, it wasn’t until I started a writer’s blog that I felt allowed to call myself a writer. Previously I had assumed I needed to have books published, and the word ‘writer’ written on my passport. Now I see every blog post written and every hour spent on my novel as an achievement – which is much more encouraging! Check out my blog at https://creakydoorwriter.blogspot.co.uk/ if you get a chance. Thanks! Great stuff Emily! …living from who we most deeply are… …we confuse readiness with courage… Loved it. Thank you for your courage and contribution. Beautiful reminder, Emily. I heard you speak a few years back at She Speaks. One of the things your said then that has stayed with me…”Leave your unique trail beauty no matter how small.” That’s my goal. And, I love this. “You don’t have to be the best one saying or living something true. You just have to be yourself.” Amen! Lana, I think we all have those few voices that rage against our courage – and isn’t it so paralyzing? It helps me to carry out my fears to their logical conclusions and realize if the worst happens, if I publish it and they absolutely hate it, good news! I am not dead. Sounds extreme, but it helps sometimes to go to the extreme and realize the worst isn’t really that bad after all. Love your post, Emily. I especially enjoying considering writing as an art and a success if it has inspired others. What a very insightful post. Thanks so much. So often, these “paralyzing statements” rear their ugly heads when things are just starting to get dark. Thanks for the reminder Emily! YES. That is true for the literal dark as well – I find my most vulnerable times is at night when I can’t sleep – I tend to question my work more during the night than in the light of day. Love, love, love this post, Emily. Looking forward to reading your book! The trailer was amazing. Thanks, Tammy! Caleb Rexius did that trailer and captured the essence of the message so well, I thought. Great post, Emily! Love how you point out the vulnerability aspect. Thank you. Interestingly enough every time I prepare to write a story someone else publishes it! When I was younger, in high school, my English teacher was the first objective person to make me feel like what I had to say was worth listening to. I’ve struggled with that throughout the rest of my life even with something as simple as they keep publishing what I’m writing before I can publish it. LOL I always said I needed to carry him around in my pocket. LOL. Love the whole thing Emily. I think the thing that can stop me is to think that my dream has to be perfect. That I can’t start until I figure it all out. I’m pushing past it most of the time but it does rear it’s ugly head from time to time. Thanks again. Oh yes – that perfectionism casts a long shadow, doesn’t it? Waiting to start until you have it figured out sounds great but doesn’t require any courage or risk. And creativity doesn’t really happen without those. Appreciate your comment. Zech, I ditto what you said. I, too, stopped letting it just be about writing and started turning it into a production. I had to have an office. Then I had to paint the office. Then I had to have a desk. Then I had to hang some pictures … before I knew it, the calendar had changed from 2012 to 2013 and I’d gotten nothing written. I had a beautiful new office … but it had never functioned the way it was supposed to … as just a space to write. Thanks for the guest post. Enjoy reading both of you. I love the insight and wisdom you shared here Emily. I’ve discovered some of the same things in a different way especially about redefining success. I love the idea of asking am I becoming more of who I really am and connecting with my true self, God and others true self. Thanks, Sharon. I have to continually ask myself that question – about becoming more fully myself – because it’s really the only result I can control. The part of your post that choked me up? Thanks for doing some heavy lifting with this post Emily. Well done. There’s a reason those stories are on my desk top. Now to share them with others. I’ve already published one book now its time for the next one, and so on until they reach those they were meant to reach. Thank you. Those statements are all very familiar to me. And I agree, they can be paralyzing. But your question, “Are you becoming more fully yourself?” gives me a new measuring line for success. Thank you for that! This is such a true statement – There is nothing to win, so you are free to stop competing with the world. I belong to a book club and we take turns hosting the club at our homes complete with a meal centered around the book’s theme. A friend, Christy, in the club is an outstanding cook and host and always makes the night a wonderful event. One time when I was hosting and preparing, I felt like such a failure and wouldn’t measure up to what Christy does. My husband said to me, “Let Christy be good at this. It’s her gift and it’s not like you’re competing with her are you?” He was so right and his words were so freeing to me. – Let her be good at it, it’s her gift. your comment stood our amongst all the other ones…why…i think because i am a member of a bookclub too and i recognize immediately what you said. but then again it is so enriching that every member shares his personal feel with the book and the inbringing of every member may be so different but so true because true to that person! your husband is so right too! All 3 of these sound very familiar… The one I struggle with most is “I am not ready”. Another one that really holds me back is “What will my family/friends think of me?”. I love the idea of taking the next step and really stepping into who I want to be, but it’s the reaction from others that intimidates me. As crazy as it sounds, what other people think of my choices influences me a lot, and I am making a conscious effort to slowly put an end to it. Yes, yes, yes. We’re never ready. It feels vulnerable. But it’s important! Perfect fit, needed this reminder. I pick me today! My greatest problem is actually getting distracted very easily. Then realizing time is almost gone, then giving up trying. I find the first and third of these statements the most debilitating – together with another one for us oldies, “I’ve left it too late”. Comparing ourselves with others, in art as in other aspects of our lives, is often pointlessly demoralizing – we only tend to see the excellence and success in others and the flaws and inadequacies in ourselves. Truth is always encouraging! Thank you for this. Me and you…. We are enough. We are ready, and we are not wasting our time. I have this problem a lot, i look through other people’s blog and i think to myself he can write better then me, his blog layout looks amazing. All round his blog looks better then mine. I was reading this from my RSS reader, but liked it so much that I had to come and say thanks. I’m constantly comparing myself to others and it’s time to stop.